The idea of game reserves and National Parks is not a modern one in Zambia. As the age of explorers and adventurers ended, the age of settlers began. Hunting of wildlife, or ‘game’ as it was termed in the late 19th century, was controlled when a total ban was placed on hippo and elephant hunting to stop exploitation from traders from Mozambique and Malawi. In 1899 the first protected area, Mweru Marsh Reserve, was created, being gazetted in 1900. This was followed by the creation of the Luangwa Game Reserve in 1904; a small reserve around the Victoria Falls in 1907; and Kafue Reserve in 1908. Although initially they were not all a success – the Luangwa Game Reserve ceased in 1911 after its founder died. Local farmers began to demand policies to control wildlife. This included the tsetse fly which causes sleeping sickness in both cattle and humans. By 1925 it was realised that game was becoming rapidly depleted in some areas. The discovery of rich copper ore in 1925 had led to the increased employment of workers, with game meat being used to provide a much needed source of protein. As rail and road infrastructure grew the illegal commercial exploitation of game became more widespread. This was most acute in areas next to the railway lines. As firearms had also become more accessible since the First World War there was an increase in excessive hunting by rural populations – 407,000 gun cartridges were imported into the Country in 1927 alone. So pressure was applied to start the introduction of new conservation measures. From 1924 to 1930 the export of ivory and rhino horn had increased annually, and fur exports had reached over 10,000 a year. The value of all wildlife exports averaged £15,800 a year and reached £21,000 in 1928 (being equivalent to US $400,000 today). Whilst revenue from gun and game licences averaged £8,900 a year (about US $95,000 in today’s terms). There was no expenditure on conservation as there was no Game Department. From 1926 some provincial administrations did give rewards for the killing of wild pigs and baboons which were seen as agricultural pests. National rewards were paid for killing vermin – which included lions, wild dogs, hyena and leopards. There was no control on the shooting of crop-raiding elephants. So legal steps began to be put in place to project wildlife by the creation of game reserves, protected areas, the formation of an elephant control unit and the issuing of licences to limit hunting. 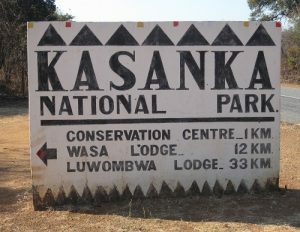 The small Mulaushi Game Reserve (now Kasanka National Park) had been established in the 1920s. In February 1931 the vast Livingstone Memorial Game Reserve, which covered a massive area of over 1,200 square miles and bordered the then Belgium Congo, was also established. It was soon realised that balancing the need for game reserves, with the needs of the local people, was a logistical problem – not only were elephants invading people’s gardens and eating their crops, but the requirement for game meat was reducing wildlife populations. It was quickly seen that the massive Livingstone Memorial Game Reserve was too big to function properly and so it was reduced in size and divided up into two reserves – where Kasanka and Lavushi Manda National Parks are today. In 1931 the Game Warden of Uganda, Captain Charles S. Pitman, was invited to survey the fauna of Northern Rhodesia. His report, published in 1934, stated that in the previous 25 years, 75% of many wildlife species had disappeared. Although it also reported that the more ‘robust species’ – such as buffalo and elephant – were flourishing. 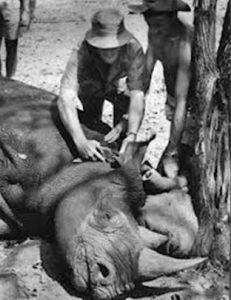 Pitman recommended the need for conservation areas, to stop the hunting of Black Rhinoceros for their horns and to implement strict elephant controls. Despite his report wildlife management at this time was only thought of in terms of animal control – the hunting of vermin (wild dogs, leopards and hyena) and on containing animal diseases from spreading to livestock. Up until 1931 it was forbidden to kill buffalo. But as they were thought to spread tsetse flies amongst cattle and people they were declared a ‘vermin’ species and so local hunters were encouraged to shoot them. During this time wildlife continued to be exploited for food – with the number of wild animals declining rapidly, especially in urban areas and along railway lines. They were also being displaced by the expansion of farms. The economic depression in 1932 led to the near financial ruin of the mines. Local workers returned to their homes and this put more pressure on local wildlife due to subsistence hunting. The demand for export game products, including ivory, dropped. 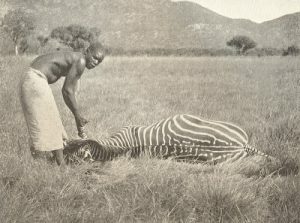 It was thought that subsistence hunting provided a much needed meat supply and that rural villagers should continue to exercise their traditional rights to hunt. In 1937 the implementation of the Game Laws were negligible, with only 120 prosecutions for gun and game law offences throughout the Country. As the economy recovered, workers once again left their villages and subsistence hunting decreased. Domestic meat products produced by farms was on the increase for towns and mining communities and the trading in game meat was largely forbidden. 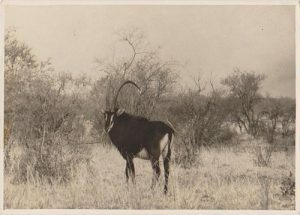 Although conservation was not seen as a major concern there was increased pressure to enforce the agreements that had been made in the Conservation for the Protection of the Fauna and Flora of Africa (1933). Wildlife was still mainly viewed as vermin which should be controlled. The Department of Game and Tsetse Control was created on 1st January 1940 and for the first time a clear policy, with an ecological approach to the conservation of wildlife, was adopted. In 1941 new legislation was introduced, initially to protect subsistence hunting. Controlled Hunting Areas (CHA) were declared to enable residents to be able to hunt freely, with non-residents only hunting with controlled special licences. In 1945, after the end of the Second World War, it had been found that the number of game shot for animal control had been more than previously expected. There had been a neglect in small animal control, with an increase in hunting of leopards and other predators for their skins. This had led to increased problems of crop damage as the numbers of wild pigs and baboons had risen. Rewards for vermin control continued but leopards were taken off the vermin list. Jackals were added to the list in 1950 due to a threat of rabies. During this time more than 3,840 herbivores and 550 carnivores were reported killed by the control units and reward hunters. The first game-proof fences were built to prevent game animals from going back on to the land that had been cleared as protection against the tsetse fly. And as rural populations increased, more large game animals were being killed outside of protected areas. During this time the first Honorary Game Rangers were appointed. In 1944 35 volunteers from the Copperbelt, Southern and Central Provinces assisted the then small Game Department, with law enforcement and animal conflict control. The Copperbelt, which is one of the oldest Units, started up under National Parks and the Wildlife Services of Zambia, and volunteers were called ‘Wildlife Conservation Officers’. 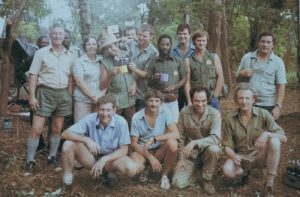 Their first meeting was at the aptly named Elephant Hotel in Kabwe in 1972 and the Honorary Wildlife Rangers Unit was formed. 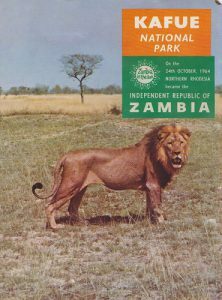 This Unit was then adopted under the Wildlife Act of Zambia and when National Parks became the Zambia Wildlife Authority, the volunteers were renamed Honorary Wildlife Police Officers. Over 70 years later, the Unit still exists, with volunteers from across Zambia helping with law enforcement, education and public awareness campaigns, and providing technical advice and additional resources to the Department of National Parks and Wildlife. The Unit has always been self-funding and each Regional Unit undertakes key activities assisting with local wildlife and conservation issues. Controlled Hunting Areas (CHAs) were declared to enable residents to be able to hunt freely, with non-residents only hunting with controlled special licences. By 1953 these designated CHAs covered 56% of the country. 16 game reserves were also established, covering 6.7% of the country, with the first being the Kafue Reserve which was re-demarcated as Kafue National Park on 20th April 1950. For the first five years only the south of the Kafue National Park was open to visitors, whilst the tourist camps and roads were being built. The north was closed to visitors to let wildlife numbers increase. From 1956 parks became more accessible and at this time the total area of protected reserves and parks covered 6.5 % of the Country. Although Safari tourism had begun in the mid-1920s, when the Cairo to Cape Town Air Service first flew tourists to visit Victoria Falls with game viewing in the adjacent reserve, tourism did not take off until the 1950s and 1960s. This was when the reserves became easier to access by road and by air. Attitudes towards wildlife were also changing, with tourists wanting to shoot animals with their cameras rather than with rifles. The idea of ‘Conservation through Tourism’ was first initiated by Norman Carr. 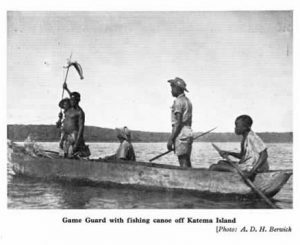 Having worked for the Game Department in the 1950s he helped set up the Country’s first visitors’ camp – Nsefu Camp on the Chipela Lagoon. This was in Chief Nsefu’s new wildlife conservation area in the Luangwa Valley which covered an area of 70 square miles. Visitors were charged 10 shillings a night and were provided with simple accommodation. They could view game on foot and were escorted by game guards. Norman was instrumental in setting up Kafue National Park and developed its Government run safari camps throughout the Park. It was here he became famous for raising two adopted lion cubs in Ngoma which were later released into the Luangwa Valley. He wrote about their exploits in his first book ‘Return to the Wild’. Norman then went on to set up his own photographic safari business in the Luangwa Valley where he invented the ‘Walking Safari’ and was the first person to create ‘Green Season Safari’s’ for tourists visiting the parks during rainy season. Although he sadly died in 1997, the company he set up is still welcoming tourists to the parks today. In 1953 the first conservation society was formed – originally known as the Game and Hunting Preservation Association, it became the Wildlife and Environmental Conservation Society of Zambia (WECSZ). Today it is best known for its educational programs and community based Chongololo Clubs. In 1957 WECSZ helped raise resources for the region’s first and largest wildlife rescue – Operation Noah. This rescue took place between 1958 and 1964. After the Kariba Dam was built across the Zambezi River the Kariba Gorge was flooded to form the massive Lake Kariba. 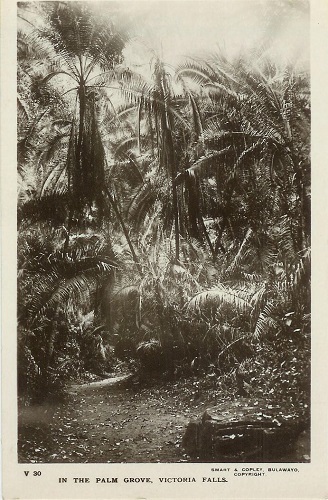 The gorge was home to the Tonga people and to thousands of wild animals. As the lake began to fill, the local people were relocated but the wildlife was stranded on the hilltops which were fast becoming shrinking islands. For over five years Northern and Southern Rhodesia’s Game Rangers, Tad Edelman and Rupert Fothergill, along with a team of Wildlife Wardens and volunteers, herded stranded animals to safety, trapping and ferrying any animals that could not swim to dry land. These Wardens, alongside vets, pioneered the use of tranquiliser darts to capture larger animals, such as buffalo, rhinoceros and elephants. They were then roped and hauled onto raft pontoons and floated to safety. The Rangers and volunteers lived and worked in very basic conditions, often just using ropes, sacks and nets whilst travelling around in rowing boats to rescue over 6,000 animals – elephants, rhinoceros, lions, leopards, antelope, zebra, warthog, snakes and birds. Many of the animals rescued on the northern side of the lake were relocated to Lower Zambezi and Kafue National Parks. 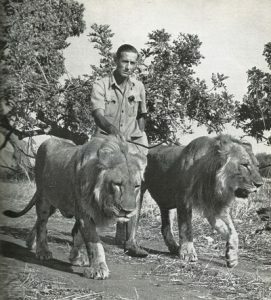 During Operation Noah knowledge about wildlife ecology was collected and ground-breaking capture techniques were developed. This amazing rescue mission led to the founding of many of the regions conservation NGOs that we know of today. In 1963 the Department of Game and Tsetse Control was renamed the Department of Game and Fisheries. It was again renamed after Independence in 1964 as the National Parks and Wildlife Service (NWPS). Although there were no distinct policy changes, tourism was developed and as protein malnutrition was widespread, a research program was started on the domestication of wildlife species. This involved only eland and lechwe species which were bred for their meat in tsetse fly areas as an alternative to tsetse fly clearances. For the first time wildlife was being seen as a national asset and as a resource to be used to benefit the people. From the mid-1960s the export of large numbers of animal and reptile skins began to fall, and the exploitation of species just for their skins was causing concern. Although ivory exports fell from 28,000 kg in 1964 to 20,000 in 1965, the actual number of exported tusks had risen, due to the larger number of smaller tusks being exported. These exports could not be sustained and the value of wildlife exports fell as international demand decreased due to changing attitudes towards wildlife products. Control hunting continued, primarily on large and dangerous animals who damaged crops and on rare occasions on lion who preyed on cattle near Kafue National Park. Tsetse control hunting also continued with between 1,600 and 1,800 game a year being killed outside the game fences. In 1965 a Luangwa Unit was established to develop the Valley and to look at the environmental degradation in the Parks. Wildlife cropping for commercial game meat began in 1966 – mainly on elephant, hippo buffalo and impala. This was very controversial as ecologists believed that wildlife cropping was not necessary and that environmental problems were being caused mostly by fire and only indirectly by elephants. Locals were not directly benefiting and it was not popular with tourists or the international community, especially as there were no known scientific benefits. The 1966 trial to produce meat by cropping game animals was shut down in 1969. A second trial was planned for Lochinvar Ranch, using lechwe antelope and the ranch was declared a GMA in 1967. 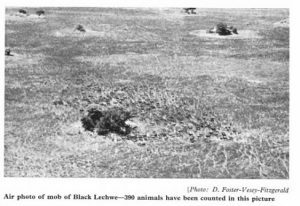 Generally only old male lechwe were killed, but due to high levels of disease many of these carcasses were condemned and the trial was found not to be economically viable. In 1972, 17 National Parks were gazetted by the NWPS under the National Parks and Wildlife Act. The largest being Kafue National Park, the most famous being South Luangwa National Park, and the smallest being Mosi-oa-Tunya National Park. Two more National Parks were also gazetted during the 1970s – Nsumbu on the shores of Lake Tanganyika and Blue Lagoon in Central Province. The old CHAs were revised and restructured and in their place Game Management Areas (GMAs) were created. These GMAs surround the National Parks and act as buffer zones where both people and wildlife co-exist. Local people were able to utilise natural resources but could only hunt by licence. Sadly the 1970s and 1980s were a difficult period for conservation. Economically Zambia had been reliant on copper prices but a decline in the market meant that the Country experienced a rapid economic downturn. This lead to rural populations looking for new ways to survive. At this time ivory and rhino horn poaching was on the increase across Africa due to a sudden escalation in demand due to a rising prices. This led to an upsurge in poaching by commercial organised gangs throughout the continent. 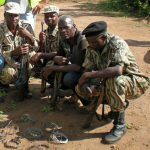 The NPWS did not have the resources or manpower to combat these criminal gangs and international organisations were invited to help protect the wildlife with several donor sponsored NGOs being set up as a stop-gap measure to prevent poaching. One of these was the Save the Rhino Trust. 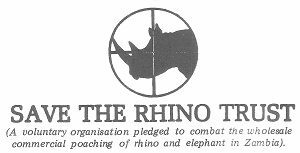 In 1980 it attempted to combat commercial poaching which was threatening to exterminate local rhino and elephant populations. The Trust reported that the slaughter of black rhino had escalated, with numbers dropping from 4,000 in 1973, to 2,000 in 1979. Elephants were also targeted by these commercial gangs and during the 1970s it is thought that the Luangwa Valley’s elephant population had been reduced by 50,000. Sadly their initiative failed and by 1989 rhinos were declared extinct within Zambia and elephant populations had been reduced by 75%. Other donor funded organisations, such as the Owens Foundation in North Luangwa National Park and the Kafue Anti-poaching Company in Kafue National Park, were also not successful due to poor funding and in trying to replace, not partner with, the NPWS. In 1986 the North Luangwa Conservation Society, funded by the Frankfurt Zoological Society, was set up to logistically support NWPS with anti-poaching. And after the international trade ban on ivory in 1989, Conservation Lower Zambezi, which is funded by the tour operators in Lower Zambezi National Park, was formed. Both of these are still operating today. The first private-public partnership agreement between a conservation NGO and the NWPS was for Kasanka National Park. The Kasanka Trust, which had been set up in 1987, was given permission to jointly run the Park on 18th July 1990. This was the first initiative of its kind in Southern Africa. The Trust was tasked with wildlife management, developing tourism and working with the local community. This agreement was the foundation stone for many of the conservation programs you now find across the Continent today. More recently African Parks took on the management of Liuwa Plains National Park in 2003 and the Bangweulu Wetlands in 2008. Over the past 25 years conservation NGOs have been set up across the Country which provide support and assistance for their local National Parks. For example, Conservation South Luangwa, which was initially set up as an anti-poaching target force in and around South Luangwa National Park, has evolved to work with local communities around the Park in projects employing Zambians to provide sustainability for conservation. When the Government decided to transform NPWS into a corporate body that would work more closely with the private sector, the Zambian Wildlife Authority (ZAWA) was established under the Zambia Wildlife Act No 12 of 1998. ZAWA was mandated to integrate wildlife policy with economic, environment and social policies to ensure effective contribution to sustainable national development with the Act giving the new authority more autonomy and financial independence. This model of conservation administration was found not to be workable, and on 1st January 2016 wildlife management was once again transferred back to Government in the new Department of National Parks and Wildlife (DNPW) under the Zambia Wildlife Act of 2015. 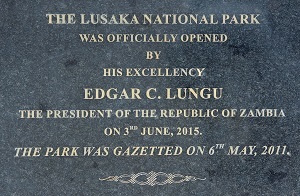 Lusaka National Park is the latest park to the gazetted, which opened its doors to the public in June 2015. ZAWA had already taken over the Munda Wanga Environmental Sanctuary and National Botanical Gardens in Chilanga in 2014, with the aim to upgrade its educational facilities and to promote wildlife and its environmental benefits to the local Lusaka population. 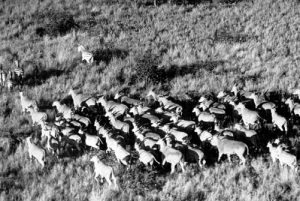 Although conservation in Zambia began almost 120 years ago, many of the same issues are still with us today – the illegal demand for ivory still comes from overseas, farmers still have problems with invading wildlife destroying their crops and the demand for traditional foodstuffs, including game meat, is on the increase due to population increase. Wildlife has always been an important resource and asset. In some areas uncontrolled exploitation has resulted in the elimination of many species, especially the larger mammals, whilst in others a reduction in habitat has eliminated them altogether. Conservation methods have changed – from viewing wildlife as dangerous game that had to be controlled, especially to stop the spread of diseases, to the protection and conserving of wildlife in order to improve local livelihoods and for wildlife to be included as an important part of the national economy through tourism. With more people having access to their local National Parks and protected areas, the movement to conserve Zambia’s wildlife and its habitats is shifting from being internationally led to nationally led, with more Zambians taking leading roles in the conservation of our wildlife.